Hate has no place in the house of God. No one should be excluded from our love, our compassion or our concern because of race or gender, faith or ethnicity — or because of their sexual orientation….It is time to stand up against another wrong. Gay, lesbian, bisexual and transgendered people are part of so many families. They are part of the human family. They are part of God’s family….Uganda’s parliament is debating legislation that would make homosexuality punishable by life imprisonment, and more discriminatory legislation has been debated in Rwanda and Burundi. It is wonderful to hear these words. They are a great contrast to bloodthirsty hate preachers like Uganda’s Martin Ssempa, who is using Christianity as a cover to commit potential mass murder. 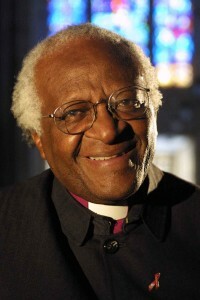 We could use more inclusive, inspiring voices like Tutu’s in Africa and throughout the world.